Easily transform patient care from volume to value with patient-centric message exchanges. Volume-based, fee-for-service healthcare models are an endangered species. The varied cost structure, increases in medical errors, and poor patient satisfaction levels have been the impetus for government regulators to completely restructure how healthcare providers and Medicare do business. Due to requirements of the Affordable Healthcare Act, providers are now expected to produce value over volume in the care they administer to patients. This required change has set the healthcare industry on its ear, yet few organizations have taken the first steps needed to ensure smooth transitions they will soon be facing. Industry experts estimate the transition from volume to value-based care to be worth upwards of $1 trillion. Several Value-Based Healthcare programs have already been implemented and there are clear indications from The Centers for Medicare and Medicaid that these will continue to expand. Prior to this push, a patient was out-of-sight, out-of-mind once they were discharged from their initial hospitalization, regardless if their treatment continued to an external, post-acute environment. The new CMS programs require hospitals and ACOs to take on more of the financial risk in the care and outcome of their patients. Comprehensive Care for Joint Replacement (CJR) is the first mandatory program and several others in cardiology and oncology are being introduced. 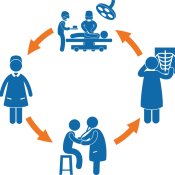 With value based Care Programs, hospitals receive a single bundled payment for the entire patient care episode. Furthermore, additional and unexpected treatment costs are the hospital’s responsibility. 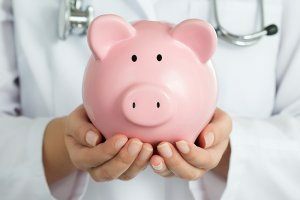 Certainly, hospitals strive for the best outcomes of their patients, but with these new requirements, they now have a financial incentive to achieve and maintain better results. Healthcare organizations need to innovate to adapt to the responsibilities and challenges of Value-Based Healthcare Programs in order to succeed. One of the greatest challenges about Value-Based Care is around the transitions from acute to post-acute care. Physicians commonly lose touch with the patient after hospital discharge and rarely know of, much less communicate with the organizations or individuals coordinating recovery and rehabilitation. Often, they are not promptly informed when a patient’s condition changes and often are only contacted when the patient is readmitted. This creates an avoidable cost burden to the hospital. By improving the collaboration and workflow between acute and post-acute care the patient can be better managed and unexpected costs avoided. In truth, the current fee-for-service model produces an environment that leads to expensive and, in some cases dangerous gaps in communication when patients transition between care facilities. These gaps can lead to completely preventable medical errors, repeated tests, and readmissions. This is where CareChannels by QliqSOFT can play a major role in new Value-Based Care models. This platform helps with the elimination of healthcare silos, by creating a continuous communication link between care team members across transitions of care and organizational boundaries. CareChannels are patient-centric message exchanges that allow the appropriate care team members to collaborate on the patient diagnosis, treatment plan and related questions from a smartphone or desktop computer. 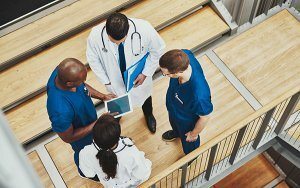 To achieve better collaboration with Value Based Care programs, hospitals need to adopt more effective clinical collaboration solutions and technology. CareChannels automate and simplify this clinical communication even as the care team changes from admission, inpatient treatment, discharge to skilled nursing facilities and then to home care. Care teams are able to improve clinical communication and drastically reduce costly mistakes when there are no barriers to collaboration. A CareChannel’s focus on a single patient produces immediate value in the patient’s treatment as those care team members are able to communicate continuously from pre-admission to post-discharge. Upon initial hospitalization, a CareChannel is automatically created as the admitting nurse enters patient information into the EMR and the appropriate care team members are then assigned to the patient. Each member of the patient’s care team is notified of the new patient CareChannel on their smartphone or computer app and can securely exchange text messages, patient information, images and other documents. The CareChannel is linked to the patient record and augments the structured EMR patient documentation with the contextual details that occur in collaboration among healthcare providers. It also enables physicians to maintain a more detailed electronic paper trail of services performed, which allows for proper documentation for bundled payment care. Medical orders can even be shared with the entire care team, making sure that each member knows what medications have been prescribed throughout the course of treatment. This collaboration bridge is especially valuable during the transition from acute to post-acute care where cross-organizational communication is undervalued. During discharge, the health care providers at the SNF and home healthcare organization will be added to the CareChannel to immediately begin communication with the hospital and facilitate the transition. Home health nurses will be able to see the entire length of conversations across the care episode and have an open channel to surgeons and physicians during recovery. This continues the collaboration that began at admission. When needed, a quick message exchange between the patient’s home care nurse and the surgeon can occur which could easily prevent readmission. The continuing collaboration ensures better outcomes, saved time and improved bottom lines for healthcare organizations. CareChannels is the key to unlocking hospital success with Value-Based Care programs. Healthcare’s mandate to provide Value-Based healthcare over volume-based healthcare is proving to be a difficult row to hoe for many organizations. Adapting to a Value-Based HealthCare model requires many healthcare organizations to completely rethink how they treat and manage patients. The time is now to prepare for Value-Based Care programs by streamlining workflows, improving collaboration methods, and linking with external healthcare partners. This preparation will increase efficiency in patient care during transitions and reduce poor patient outcomes and readmissions which will lead to success with bundled payments.